This still life, painted around 1861, is one of the oldest extant works by Claude Monet. In the early years of his career, the young artist was especially interested in this genre and would continue to work in it, without showing any further particular inclination towards it. The painting should be viewed with reference to the superb Hunting Trophy (Musée d’Orsay, Paris), dated 1862, in which Monet reveals the deep impression made on him by Troyon. He is unable to hide his admiration for the older artist on the occasion of the 1859 Salon. The composition of the work is also considerably influenced by Chardin’s large still lifes, Game Still Life with Hunting Dog and The Buffet. While the Rouen painting is certainly more modest in its ambition, the dark green curtain that Monet has used as a backdrop and the carved edge of the table in the foreground belong to the same decorative repertoire. Added to this, the powder horn with its green cord is depicted here as it is in Hunting Trophy. The emphasis given to the object reveals a taste for the picturesque noticeable in Rousseau’s work, although Monet very soon liberated himself from the constraints it imposed in order to tackle more challenging subjects such as The Joint of Meat (Musée d’Orsay, Paris), a painting with considerable substance, in the manner of Rembrandt’s The Flayed Ox. 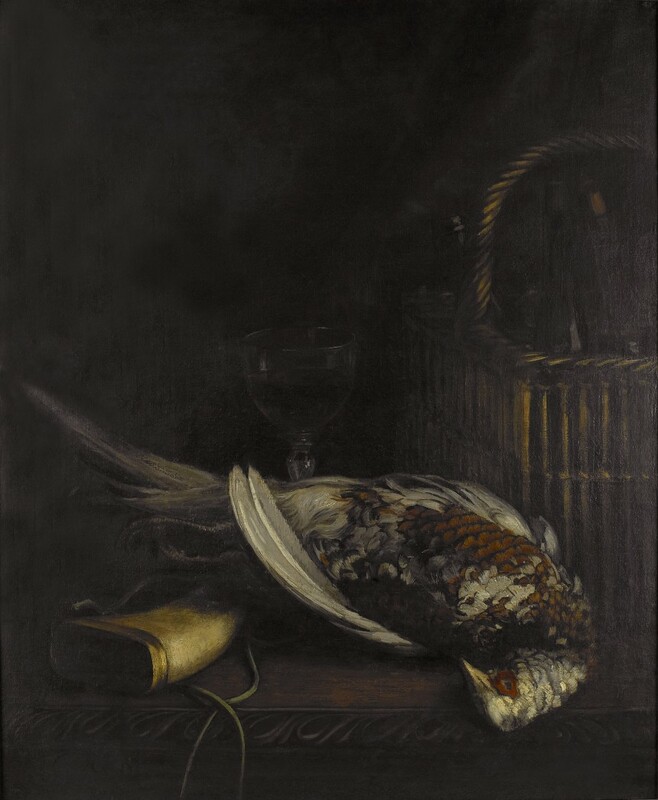 The young artist discloses his budding talent in the sumptuous treatment of the pheasant’s plumage. The technique is free and spirited; in places the rapidly applied brushstrokes let the canvas show through, creating an impression of plumpness to the bird’s crop and a silkiness to its feathers.